Home MTAANI NEWS Police rescue woman from attempted lynching on suspicion of killing son. Police rescue woman from attempted lynching on suspicion of killing son. Thika West OCPD Willy Simba talking to the press in his office where he confirmed of the death of the 7 year old boy in Kiganjo Estate Thika. A middle-aged woman who allegedly murdered her 7 year-old son in order to get married was rescued by Makongeni Police from an attempted lynching in Kiganjo Estate, Thika West Sub-County. It took the intervention of the Makongeni police who had to use force to disperse the irate crowd which was building by the minute to quell the lynching attempt after the crowd had overwhelmed the few officers from the area. Angry residents had gathered in one of the residential plots after Mutethia’s neighbours started screaming upon her release from the police on Tuesday following her arrest on the previous day on suspicion of murdering her son and dumping his lifeless body a few metres from where they lived. Locals immediately responded to the distress calls and threatened to take the law in their own hands before police from the nearby AP police post came in to her rescue. Some of the women we talked alleged that they were hurt by these police who they accused of being compromised to release the woman without pressing charges against her. “These policemen have been compromised! How do you release a murderer just like that? And when we attempt to eject her from this premises for fear of the safety of our own kids, they come here and start attacking us with kicks and blows,” retorted one woman. Homicide detectives who visited the scene yesterday had a very rough time trying to convince the neighbours to record statements that would assist them to gather enough evidence to prosecute the suspect. The neighbours claimed that this was an exercise in futility as the suspect will just be released scot-free. “I cannot record any statement with the police. What for!? Will that bring back the boy to life? I earlier on reported of his mistreatment but no action was taken. Now that he is dead, what do you want me to say?” asked a neighbour. According to the neighbours, the suspect, who is a single mother of two, rented her current house slightly over 2½ months ago. At first, she had been selling some yams and cassava for a living but later stopped and began staying idle. Mutethia is said not to be social with her neighbours and spends most of her time away from the house only for her to come back home to chew ‘muguka’. She is also alleged to entertain some male friends into her house on various occasions, especially in the evenings. The neighbours also alleged that the lady was recently engaged to a certain man who is said to be the biological father of the younger child who is about 9 months old. The man is said to have declined to marry this woman as long as she had a son from another father. The neighbours believe that it is for this reason that the woman schemed to eliminate the poor boy. “The boy’s body is full of fresh scars emanating from burns inflicted by his mother using red hot knives and pieces of metallic wires. We have tried to seek justice for him through the local security leadership but nothing has been forthcoming. The boy continued to suffer in silence,” said a neighbour. At around 7pm on Sunday, Mutethia is said to have claimed that her son was missing after she had sent him to the grocery to buy some lemon. The neighbours claim that she seemed not bothered at all by his absence and went on with her chores as though nothing had happened. “To be sincere, we never saw the boy for the whole of Sunday. In the evening she came and asked us if we had seen her son but even after not receiving any positive response, she got into her house and locked herself in till Monday morning as though nothing wrong had happened,” said another neighbour. She is alleged to have woken up the following morning and did some laundry that included clothing belonging to the deceased son. Later in the day, the lifeless body of her son was spotted a few metres from where they lived. The boy had head injuries inflicted by what looked like a blunt object. His skull had been pierced with a nail, probably to make sure that the job was thorough. “He had been hit by an iron rod on the head. I also saw a nail stuck in his head and his eyes gouged out. I was just so scared. The boy must have died a very painful death,” said one woman who lives just next to where the body of the boy was discovered. Police from the crime scene department are said to have collected samples from the scene of crime and from the woman’s house, including the clothing that had been washed by the suspect that morning. 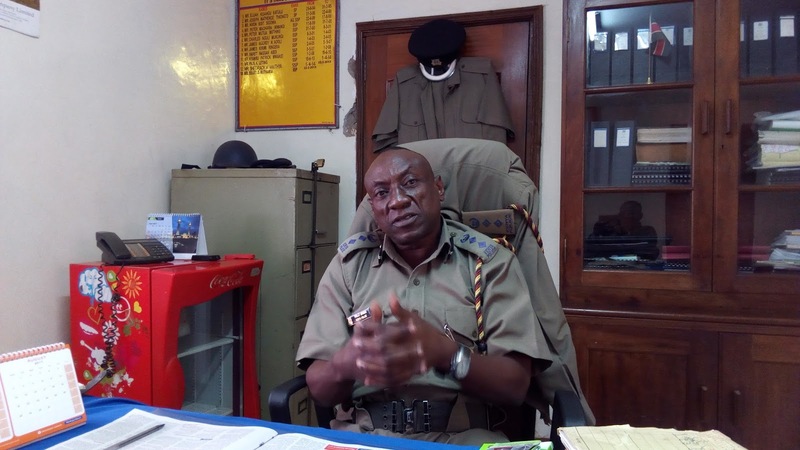 Confirming the incident, Thika West OCPD Willy Simba said that investigations were still ongoing to ascertain the cause of death for 7 year old and appealed to anyone with information to come forward and assist the police to unearth this puzzle. He also confirmed that the mother had reported the loss of her son on Sunday evening at the Makongeni Police Station. “As we speak, no one has come forth to record any statement but we are still investigating the real cause of the death. We are therefore appealing to anyone with information that can help us nab the culprits to come forth and assist us,” said the OCPD. He however, dismissed allegations that the boy had any visible fresh injuries on his body saying that he only had a nail pierced through his skull. “No. the boy had no injuries on his body other than a nail that had been stuck on his skull. His eyes were intact unlike what people are saying that they had been gouged out. Otherwise, we are awaiting for the postmortem results to further verify his cause of death,” explained Simba. He appealed to the residents to take the initiative to always inform the authorities about any cases of child abuse before they went out of hand. The residents on their part appealed for justice for the innocent boy.